Burbank, CA – The hall of fame, any hall of fame, serves as a special tribute to those honored individuals who have made a significant and historic impact on society. Reserved for those select, gallant pioneers who have overcome all odds and have become champions, founders and legends. This week the Martial Arts History Museum is proud to release their second volume of a four-part series highlighting those significant achievers who have been inducted into the arts' most prestigious club. 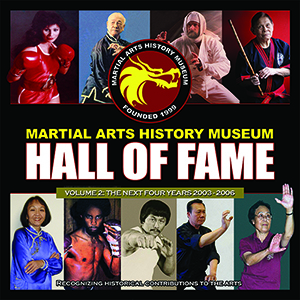 The “Martial Arts History Museum's Hall of Fame: Volume 2” features the next four years 2003 – 2006, Volume One covered the years 1999 – 2002. Forty-four trailblazers are highlighted with six pages dedicated to their accomplishments in this 300-page collector's book. “When the Martial Arts History Museum's Hall of Fame arrived, it instantly distinguished itself from the crowd,” notes martial arts historian John Corcoran. The hall of fame is considered as the epitome of a person's career. It is something that serves as a tribute for their sacrifice and pays honor to their undeniable accomplishments. “Volume 1 became our best selling item for the Museum. Volume 2 is a wonderful addition and a real collector's item for any martial artists. It's wonderful to know who our pioneers are, but more significant to learn what they did to change our lives for the better,” adds Matsuda. The Hall of Fame Volume 2 covers the lives of Billy Blanks, Howard Jackson, Kathy Long, Gerald Okamura, Cecil Peoples, Chan Pui, Lilly Rodriguez, Bill Ryusaki, Donnie Williams, Doc Fai Wong, Art Camacho, Sonny Chiba, Joe Corley, Stephen Hayes, Sho Kosugi, Michael Matsuda, Hidy Ochiai, Steven Seagal, Kou Sze, Arnold Urquidez, Byong Yu, John Corcoran, Graciella Casillas, S. Henry Cho, Michael DePasquale Sr., Jim Harrison, Ted LucayLucay, Chuck Merriman, Carrie Ogawa-Wong, Blinky Rodriguez, Steve Sanders Muhammad, Allen Steen, Joe Hyams, Cacoy Canete, Ted Wong, Wally Jay, Buck Sam Kong, Brendan Lai, Lily Lau, Miyamoto Musashi, Toshishiro Obata, Ark Y. Wong, Wen Mei Yu and Fariborz Azhakh. Or visiting the Museum's website at www.Mamuseum.com. The Martial Arts History Museum is a non-profit organization and is fully supported by donations and memberships. The Museum is located at 2319 W. Magnolia Blvd., Burbank, CA 91506. Mamuseum.com. (818) 478-1722.